The trends of 2017 and 2018 indicate that ICOs or Initial Coin Offerings represent one of the revolutions in fundraising. The ICOs have heralded themselves with so much of fanfare that it’s giving mild tremors to the very foundations of the mainstream investment ecosystem. Using ICOs, startups can raise funds by issuing tokens on blockchains. These tokens on blockchains like Ethereum are then sold to potential investors. These tokens are tradeable and fungible, quite similar to cryptocurrencies. The difference of the token’s lies in whether the tokens grant access to a service or as equity in the company. The tokens that grant access to services are termed utility tokens and the ones that entitle you to equity in the company are called equity tokens. Equity tokens are essentially security tokens that represent ownership of an asset, either in stock or in debt. Blockchain and smart contracts enable startups to circumvent the IPO route and issue shares over blockchain. This would also mean that lenders can create tokens representing the debt owned by a company, and this enables the loans to be bought by investors, enhancing the liquidity of the company, or any asset for that matter. A lot of investors believe that equity tokens, with the advantages of the blockchain and smart contracts, can become the mainstream ICO token, but the SEC of the United States signals otherwise. The equity tokens should be subject to federal regulations, and this condition means not all startups, but only the companies that have established compliance with all the regulatory requirements can issue equity tokens. Investors should use their diligence in choosing the right and compliant startups for contributing to an equity token. Utility tokens are sometimes referred to as alt-coins. To simplify things, utility tokens are like the game-arcade coins that do not have any use outside the arcade. 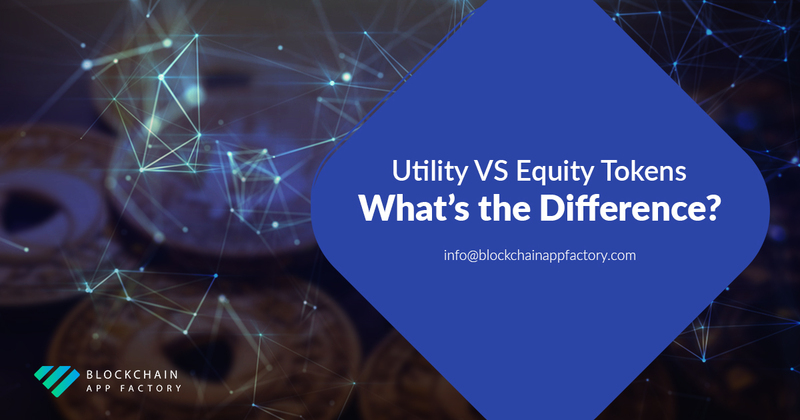 Thes utility tokens are, on the surface, used to raise funds for a startup, but the tokens do not entitle you to equity. However, as a token-holder, you are entitled to purchase future access to services or sometimes, discounts on the price of the final product. One of the best examples of a utility token is the BAT, the Basic Attention Token. It serves as a medium of exchange between users, advertisers, and publishers. Users can monetize their browsers for hosting and viewing ads. While on the surface, the utility token might not seem like an investment. However, given the value of the ‘services’ that the token gives access to, the prices are subject to fluctuation. This is comparable to the price of a sporting event ticket prices increasing if a team with a new success-stint participates in that game. Blockchain App Factory helps you create both utility and equity tokens. While creating equity tokens with utmost security and essential smart contract elements on the blockchain, we also assist you in establishing compliance with the regulatory requirements as mandated by the SEC. All you need to do is drop us in an inquiry and our blockchain technocrats will work to make your ICO vision a reality!